Steve and Ana Shawl came to Medjugorje during the first week of June for the annual pilgrimage of the Internet International Prayer Group “Queen of Peace”, which is a fruit of the “Medjugorje Web” site. At this occasion, we were happy to meet them once again, and we asked them to tell us more about the “IIPG Queen of Peace”, the “Medjugorje Web”, about their life at the service of Our Lady’s messages, about their own experiences and those of the pilgrims they have accompanied to the Shrine of the Queen of Peace. Lidija Paris: Dear Ana, dear Steve, welcome to Our Lady’s village where you feel home for quite a long time now! Before telling us about the IIPG and the “Medjugorje Web” that occupy your life, would you be so kind as to tell us how did you come to know Medjugorje, what made you engage your whole life to the service of the Queen of Peace, and , and who is the Shawl Family? Ana Shawl: The first time I came to Medjugorje was in 1983. I had heard in 1981 that a relative of ours had been cured here. I was amazed: what had happened to St. Bernadette in Lourdes is going on in my homeland, in the country of my ancestors! I said: I have to go there! In 1983, we were coming to a pilgrimage to Rome for the canonisation of St. Leopold Bogdan Mandic, and then we came over here for just a short time. When I came home, I just couldn’t get Medjugorje out of my mind. I found Fr. Svetozar’s book and it was burning in my heart. Next time I came in 1991, during the war, and then in 1992. Then I started to bring a couple of people in 1993, and then more and more people. Steve Shawl: I met Ana four months after my conversion, in August 1995, through a series of very intense events that were truly God’s grace, and that made us understand that we were supposed to be married, and this was before we ever met each other! We planned a trip to come here together in 1996 for the anniversary. This trip was the second time we had ever met in person, and on June 25th ’96, the anniversary day, on top of the Krizevac, I proposed to her. Prior to that we had only corresponded on the phone and through e-mail. I wish we had more time to talk to you about this; maybe sometime in the near future. It is an important message for all those who are lonely and/or who are looking to meet someone to spend their life with. LP: These days, you are here for the annual pilgrimage of the IIPG. Would you be so kind as to tell us what is the Internet International Prayer Group and what is Medjugorje Web? Ana Shawl: I can tell you about the IIPG, the Internet International Prayer Group. It is a prayer group that right now has al,ost 4000 members and from all over the world: Romania, Russia, India, every place, and it seems that the Blessed Mother brings them to the web-site that is like a refuge. Sometimes, people living in different parts of the world are looking for ties to Medjugorje, and they find the prayer group, and it’s like a breath of fresh air. They can talk about the messages, and that’s what we focus on: to spread and to live the Blessed Mother’s messages given in Medjugorje. We pray for each other daily, we try to say all the rosary every day, we encourage people to go once a month for confession, and through the messages we give encouragement to each other. LP: What is your role as the person in charge? Ana Shawl: I try to lead the prayer group and to make sure that we stay on our topic, which is spreading and living the messages. I moderate the e-mail messages, all the postings to the group. There is a couple of other moderators who also have their jobs. We put together all the prayer requests and we post them once a day. We have several priests in our prayer group. Fr. Bayer, who wrote the book “Medjugorje Day by Day”, is our spiritual director. Every Thursday, he takes all the petitions of the prayer group members and says the Mass for us in Texas. Yearly, we have this pilgrimage to Medjugorje. I make sure that all stays in line with the spreading and living of the Blessed Mother’s messages. Anybody need help, suggestions of the group, how to say the rosary, how to fast, how to practice it: how do you do it as a mother, as a businessman, how can we all live these messages in our own lives. That’s basically what I do. LP: Are all the members of the prayer group Catholics? LP: One could say that in a certain way you have been precursors of the Holy Father’s “Church and Internet” and “Ethics on Internet”? Ana Shawl: We really try to live what the Holy Father says and we are really trying to encourage each other to pray and to make it living in our lives, to make Gospa close to us. She brings Her Son to everybody. We try to get together to pray in each country, we try to pray at the time when Our Blessed Mother comes in Medjugorje. Some people get up at 4am. When there are Masses in Houston, some get up in the middle of the night to be united in prayer. We also have activities: for Our Blessed Mother’s birthday every year, we have a three day fast on bread and water. There are people who fast for the first time on this occasion and they are surprised that actually they can do it! LP: The IIPG exists since 1998. Steve has been doing something for a number of years before this prayer group started. What was it? Steve Shawl: Without spending too much time with my personal story, it is important to know how the “Medjugorje Web” was born, and why it was born. Being born and raised catholic, I had fallen away from the Church for many years, and as a result of a profound experience I had in my own home: I truly felt the presence of Our Lady in front of me, I truly felt the incredible love and grace of Our Lady in my heart, and it literally transformed my faith in an instant. I heard Our Lady speak to my heart. She asked me to help spread the message of Medjugorje through the Internet. I owned a computer business, but the two are not necessary related, and not knowing anything about the Internet at that stage of my life, I remember answering Our Lady out loud and telling Her: “Blessed Mother, if this is not my imagination, and if this is truly what you are asking of me, you have to make this happen, because I do not know how to do this.” Immediately the next day the phone started ringing. Within a month, all the connections were made and a few months later, the “Medjugorje Web” was on-line. As a result of this intense experience, of my conversion, and not having been to church for over 20 years, the following day I went to daily Mass, went to confession for the first time in over 20 years, started fasting on Wednesdays and Fridays. I started living Our Lady’s messages in an instant. It was a very grace-filled period of my life. Having come to Medjugorje nine months later, when I was walking alone through the fields, I felt a strong feeling of “deja vu”, that I was truly home, and that I knew I would be back again. Since that time, I have been here 34 times. We started leading groups here in 1996 and it has become, in retrospect, a very important part of the Medjugorje Web, and our mission. It is important to keep people in touch with Medjugorje, not only those who are unable to come to Medjugorje, but also those who have already come. Many go back home and have difficulties trying to keep up the same fervour and faith that they found here in Medjugorje. So along with the IIPG Group, the “Medjugorje Web” is a resource tool, so people can keep the message of Medjugorje in front of them. It has been a very, very fruitful, and incredible experience for both of us. Some day we’ll have to share the entire story of how Ana and I were brought together. We work as a team to spread Our Lady’s message and support that message, and try to help people to embrace it, to live it, and to keep it in the forefront of their lives. Steve Shawl: That has been my life mission, and something that came very easily to me. I knew nothing about the HTML language and I don’t use any programmes, I don’t use Front Page, I don’t use anything to mark up our documents, I do it all by hand. I was just graced to be able to learn the HTML language virtually over night. To this day, I still create and edit almost all of the information you see on the Site. LP: You spread the message, you send by e-mail the monthly message, the commentaries, regular information … what is your feed-back? LP: How do you get all the translations of the message? The parish is giving only Croatian, English, French, German, Italian, Spanish and Polish? What about the other languages? Steve Shawl: Right now, we are offering 33 languages. Many priests and religious have approached us and asked us if we are able to provide other translations. We tell them that we have only what the official parish site offers. Most of them volunteer to do the translations into their language. We try to screen and filter, and to validate these people, so we never damage Our Lady’s messages. Through prayer, I hope that we have made good decisions and that all these translations are accurate. The feed-backs have been very positive, we never had anyone write to us and say that there are serious errors in the translations. Praise God! Steve Shawl: It is a difficult question! We seem to experience in the US some resistance to Our Lady’s messages, to Medjugorje, and most of that stems from the local Bishop’s position. Many priests find it a controversial subject and they don’t want to risk, so they accept the local Bishop’s position and because of that they do not encourage, they do not speak about and actually discourage people from investigating or following the events of or even visiting Medjugorje. It is a difficult situation. In our own diocese, we have a neutral position, I think of our pastor. In fact, we have invited him to come to Medjugorje. He has accepted, but we do not know exactly when he will come. The important point is he is open. He has seen some of the fruits of Medjugorje within our local parish: a 16 year old young man visited Medjugorje and underwent an incredible conversion experience. He is now in the seminary to be a priest. Just one of the many, many fruits of Medjugorje. LP: Could you give us another example of people that you have accompanied, who have received special graces in Medjugorje or through Medjugorje? Steve Shawl: There was a woman in 1999, the wife of my business partner. They have lost their 16yr. old son in a tragic car crash. She was completely devastated by the loss, and after months of grieving was unable to return to normal daily life, she was unable to work, unable even to speak to people in a normal way. She was in her own world and would visit the gravesite daily and cry. 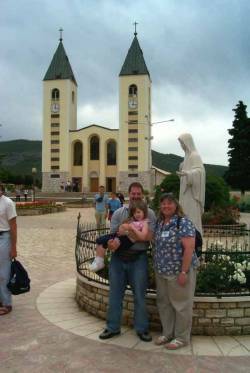 Out of desperation, she agreed to come to Medjugorje with us. We accepted her with open arms and we simply told her to have an open heart and an open mind and to come with us. The first day when we arrived, she was even more grief-struck, being 5000 miles away from home and her sons gravesite, and she cried the whole night. The following day, we went to Fr. Jozo’s, and at the time of the blessing I was standing behind her. Fr. Jozo approached her and our guide, Slavenka at that time, told Fr. Jozo that she had lost her son and that she had a very difficult time with that. He simply nodded, and when he laid hands on Diane, she rested in the Spirit. About 5 or 10 minutes later, she got up, and I could tell her face looked different, the look of pain was gone; the pain that she carried with her over the last four months was gone! She made the statement that she felt very peaceful and that she had not felt like this since before her son had passed away. She was literally instantly healed from this terrible grief, oppression, and depression. The next day after English Mass, we exited the right side of the church. It is very unusual in October that there was nobody there, except one woman. Diane immediately approached and started talking to this woman and she found out that this woman had lost five children due to accidents and illnesses. The two of them were holding each other and crying. When we walked away, Diane made the statement that she felt guilty for having grieved so much over her son, because she only lost one child, and this poor woman lost five… So the healing process continued with her, and by the time we went home, she was a completely different person and to this day, I think she holds on to this healing and this hope. I even see her occasionally at Mass. She was born Lutheran, she is not even Catholic. This is one of the many, many, many stories that we have experienced on our trips. I can honestly say in bringing people to Medjugorje, not only do we feel that it’s critical, and that it is so important to spread the message of Medjugorje beyond the written page, but we would not do it if we did not see in every single group that comes here the incredible conversions that take place in people. I am not referring to people seeing the miracle of the sun, or their rosaries turning gold, although that happens, but it is the deep, deep spiritual healing of wounds that people have carried with them for their entire life that most people never know about and never see, and they end up sharing it and they are healed from it. We have seen many physical healings as well. We had a woman from our parish come here whose little boy was dramatically healed from a birth defect. So, the graces here are absolutely unbelievable. We would not do what we do if we did not believe in our heart that this is truly from God and we are being called to do it. Steve Shawl: As far as this has affected our relationship, certainly there is no question in our mind that we were brought together for a very special reason, for a very special purpose in God’s plans, which also contains a lot of sacrifice. I am gone a lot, and travel a lot. It is hard on our kids, especially our youngest, Tihana, who is 4 yrs old. It is very hard on the family to be gone as much as I am, but the fruits and the incredible graces that come from all of this… it is all worth it. We just keep our head down, and we pray, and we do the best we can for Our Lady. LP: So, shall we say, “All you sinners, welcome to Medjugorje”!? Ana Shawl: There was a lady who was on contraceptives, who did not want to have a child. Now, her children are coming on pilgrimage with us! What is so good for both of us is to see their eyes that open because of Our Blessed Mother touching their hearts. You see God touching their hearts. That is the best. I could sit and listen to their conversion stories all my life long. Steve Shawl: Certainly, we have been drawn to a very spiritual path in life. We have struggled, we have attacks and challenges that bring us to greater depths of love for Our Lady of Medjugorje. We truly live our lives for Our Lady the best we can. We have no other jobs, 100% Medjugorje in doing Our Lady’s and Jesus’ will. I can’t imagine doing anything else. It is truly a grace. It is a sacrifice, we embrace it, but I would not trade it for anything else. Ana Shawl: I pray every day for whoever it was who prayed for my conversion. Who knows who they are? LP: Just the final question: According to you, what is Our Lady’s plan? What does she want from us here? What is Medjugorje all about, in fact? Ana Shawl: She said one time: “If you knew how much I love you, you would cry for joy.” I think of that all the time. All of her kids throughout the world just don’t know her love and how much she wants us to come to Her Son. LP: A question for you as a woman: Do you think that there is a risk for people who come to Medjugorje to discover Our Lady and “get stuck”, do not want to go further, to Jesus, to the Holy Spirit, to the Father? Is there a risk? Ana Shawl: I think that, in the beginning, they are drawn to her, just like running to the mother. But I think that after a while She brings them to her Son. If anybody is fixed on her, She will shift it! Like a good mum who says: “Go to dad”. If you read her messages, you see that it is all about her Son. Once you start following the messages, you will go that way. Steve Shawl: In my own experience of conversion, there was a simultaneous deepening of love of Our Lady and a yearning for the Eucharist and all the sacraments of the Church. Coming to Medjugorje is a very special gift and grace. Once you receive that grace, I truly believe that you are being invited into Our Lady’s army against evil. All we have to do is to look around and see the incredible evil that has permeated our society and the whole world. It’s truly a spiritual war that is taking place, building up to something. Being invited into Our Lady’s army is an incredible gift and grace, and at the same time, it’s a responsibility to pray for others and help spread that message by the example of our lives, and not just through words. LP: So, let us thank God for this beautiful life experience, for the beautiful service that you are doing for the Church, in spite of that fact that Medjugorje has not yet been recognised officially by the Church, let us hope that, when the times comes, the Church will say whatever is necessary on Medjugorje. In the meantime, let us continue to be good, generous and humble servants. Thank you for all that you are doing and for being what you are!